Once upon a time, when actors like Robin Williams, George Clooney, Jennifer Aniston, and Steve Carell left TV behind to embark on a movie career, it seemed like the most natural next step: They’d become so famous that the measly, lesser TV screen could no longer hold them. Movie stardom had long been considered the holy grail for a TV star to aspire to, and actors on the rise would agitate to get out of their small-screen contracts — or schedule their blossoming big-screen gigs around those infernal commitments — in order to make that second act happen. These days, though, that career path no longer seems like such an imperative. Long after his Emmy-winning stint on Breaking Bad has ended, Aaron Paul finally has his first studio lead in this weekend’s Need for Speed, which is about as far away from the caliber of his classic AMC show as you can get. His Breaking Bad co-star Bryan Cranston delivered one of the all-time great performances on that show but is usually cast as no better than the third lead when it comes to movies. And then there’s Jon Hamm, a matinee-idol type who spent his peak Mad Men years on small supporting roles in film and is only just now toplining his first movie with this spring’s baseball movie Million Dollar Arm. Ten years ago, a major film career would have been seen as an inevitability for each of these three men; today, it seems like an afterthought. Has the TV-to-movies career arc become outdated? The movies used to confer better paychecks and greater fame than television, but these days, as film studios clamp down on big salaries and TV networks pay a mint to retain stars until syndication, that gap has nearly closed. Actors used to escape to the movies so they wouldn’t be stuck playing the same role for years and years, but as film executives become permanently wedded to the franchise model — Marvel famously signs its actors to a deal that could span up to nine movies, a contract far more long-lasting than any traditional TV commitment — that distinction has evaporated, too. And why would you worry about a film career when TV can now offer greater acclaim and bigger audiences? A passel of young hunks like Taylor Kitsch, Kit Harington, and Joel Kinnaman have all led megabudget movies over the past two years, but they’re still much better known for their TV work on Friday Night Lights, Game of Thrones, and The Killing, respectively. Brand-new, bona fide movie stars are few and far between now — which is why the industry is clinging to Jennifer Lawrence like a life raft — but there’s no ceiling on TV stardom, and that’s where the audiences are more ardent: Benedict Cumberbatch appeared in almost every movie last year, but his scant few episodes of Sherlock generated more online fan noise than all those films combined. Now, instead of actors making the jump from TV to movies, the opposite career arc is increasingly viable. Movie stars used to deign to do TV only when their big-screen potency had waned, but plenty of actors are currently making the transition while still at the peak of their powers. It’s notable that in the year that Matthew McConaughey won an Oscar, he’s got even more people buzzing about his performance in HBO’s True Detective, and McConaughey isn’t the only marquee star who’s enamored with the medium: In addition to whoever HBO lands for season two of True Detective — and they can probably shoot for the moon on that one — Dwayne Johnson will star in the network’s Ballers (even as the Fast and Furious franchise has made him bigger on the big screen than ever before), and top comics like Ben Stiller have been developing series they’d star in for HBO, too. Even Philip Seymour Hoffman, who earned accolades as one of the most accomplished film actors ever upon his death last month, had segued from The Hunger Games: Catching Fire to filming a recent pilot for Showtime. Things are even more interesting on the distaff side. TV has always attracted film actresses in their late 40s, and indeed, Halle Berry and Viola Davis are two of the big names who’ve recently signed on to make a TV series, but young film actresses are flocking to the medium in ever-greater numbers, unwilling to spend their 20s and 30s simply playing the love interest on the big screen. After the movie Frances Ha proved to be a professional breakthrough for Greta Gerwig, she surprised many pundits by eschewing a movie follow-up in order to star in the CBS pilot How I Met Your Dad, following the path set by her indie ingenue predecessor Zooey Deschanel (who spent her 500 Days of Summer capital on the hit comedy New Girl and hasn’t made a new movie since). Vera Farmiga didn’t wait until her late 40s to transition to television: She was nominated for an Oscar in 2010 and a mere two years later signed on to topline the A&E series Bates Motel. And just yesterday, HBO announced that it had wooed big-screen fixture Olivia Wilde back to TV to play the female lead in Martin Scorsese’s new rock and roll drama. It’s nothing new to declare that we’re in a golden age of TV, but that’s not the only reason why a small-screen gig has become so respectable: In the meantime, the movies have dropped the ball when it comes to providing the meaty, dramatic parts that actors yearn to play. McConaughey was barely able to get Dallas Buyers Club made as an indie and the production nearly shut down when it lost a key financier for its meager budget; in comparison, True Detective was a breeze for HBO to green-light and the network has treated the expensive, auteur-driven show as the crown jewel of its lineup. Lead roles for movie actresses have become so scarce that Cate Blanchett made it the centerpiece issue of her Oscar acceptance speech, so it’s no wonder that Olivia Wilde, who has often complained about the purely decorative movies roles that actresses are offered, finally had enough and headed back to a medium that has no trouble passing the Bechdel test. 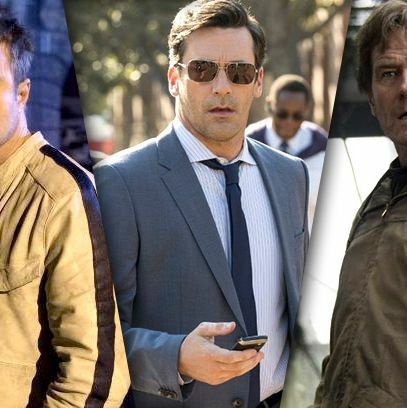 So while Need for Speed likely won’t turn Aaron Paul into a major movie star and Million Dollar Arm won’t supplant Mad Men as the gig Jon Hamm is best known for, maybe that’s just fine. They deserve better than those two movies, but only television has the best to give them. They don’t need to make it in film. After starring in two of the best shows of all time — two shows that will continue to make more noise than nearly any movie released this year — they’ve already made it.